The Poppet and the Lune is a delightful modern fairytale that i think will appeal to children and adults alike. Madeline Claire Franklin is a fantastic fairytale maker, and i think we will hear a lot from her in the future! I cant praise this book high enough! It is just that cool. I would recommend the story of The Poppet and the Lune to anyone that want to read a fairytale, and this is a book i will hear again, and again! The Poppet and the Lune is going to be one of the novels i will set time aside for every year to "re-listen"! That is a high praise from a "Book nerd" like me! 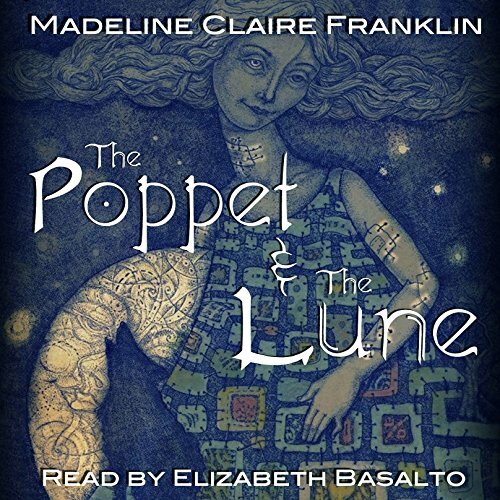 Elizabeth Basalto did a wonderful job of bringing the story of The Poppet and the Lune to life. I thought her voice fit the fairytale very well. She was good at doing different voices, and that is needed in a fairytale. She makes this fantastic book even more alive! Elizabeth Basalto is just very talented, and i cant say something negative about her reading! What did you love best about The Poppet and the Lune? That even though it was a fairytale, it did not shy away from the darker sides to life. Have you listened to any of Elizabeth Basalto’s other performances before? How does this one compare? This is the first performance I have listened to and I am really impressed. Elizabeth is very talented and did a wonderful job in bringing the story to life. a must read for fairy tale fans! I LOVED this book!It reminded me of Clive Barkers Abarat. Elizabeth Basalto did a wonderful job narrating!The Poppet was a girl,sewn together from remnants of a towns dead children.A town witch took pity on the townspeople and gave them a daughter to share.Things happened,the Poppet left in search of her worth and her name.She meets a wolf,who is not always a wolf.Of course there is a villain after them. A great story.I've recommended it to friends. Where does The Poppet and the Lune rank among all the audiobooks you’ve listened to so far? This is up there for me. It was interesting, and the take on the classic fairytale was very original. I enjoyed the lyrical quality to the writing a lot. It takes a real talent to take simple writing, and add depth to the simplicity. It's one of the things I love about Herman Hesse, Angela Carter, Kim Ecchlin, and now Madeline Franklin! What about Elizabeth Basalto’s performance did you like? She has a wonderful depth to her voice. The perfect choice for a fairtalesque story. I wish she could narrate all the classic myths and tales. I'd love to hear her tackle a Grimm Brother collection. This epic fabrication created by Madeline Franklin took you back to those once upon a time days and inserted a new story about a young patch-work girl's journey to find her identity. With twists and turns, beasts and fairies, this story--albeit a bit long-- will have you listening intently to the end to learn the final piece that makes this patch-work girl whole. I was impressed by Franklin's imagination and creation of new fairytales. It was well written and easy to follow. Elizabeth Basalto narration was quite sing-song in its quality which I believe fit a story such as this. It was repetitive in its tonal variation but was easy to listen to. Her character voices were distinct which helped keep the story moving. Overall I enjoyed this book. The Poppet and the Lune is a beautiful fairy tale that gives listeners/readers a strong, empowering woman lead, a guy lead I loved, a solid romance and world building, and wonderful writing. It was heartbreaking at times and other times I downright cheered. I recommend this audioboook. Interesting adventure romp which defies expectations. You can't help but love the characters and want to know what will happen next. It was certainly unique, and I appreciate that she made the patchwork girl seem magical, rather than gory. The narrative could have been edited a little better, sometimes the prose was too purple. However, it doesn't distract from the story much. The narrator was great, I thought her voice fit the fairytale setting very well. She was good at doing different voices. I set the speed to 1.25x, which was fine, not too fast and not too squeaky.